If you could turn back time, would you? A senior nurse today may have more influence than their 1987 counterpart but they are also working in a complex system under huge pressure. 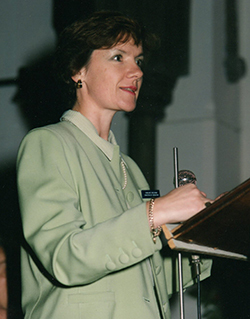 Caroline Shuldham marks Nursing Standard’s 30th birthday by examining the development of senior nursing roles over the past three decades. A ward sister presides over a handover in 1987. Hierarchies flattened, patients armed with information from the internet, higher education for nurses, a digital revolution and millennials in the workforce – all part of the world of nursing in 2017. But how did we get here? 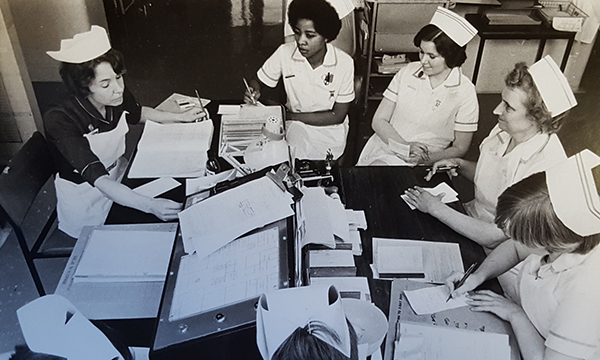 In particular, how have senior nurse roles changed over the lifetime of Nursing Standard? In 1987 I worked in a hospital-based school of nursing. Nursing education was changing with Project 2000 as students ceased being apprentices, as I had been, and the healthcare assistant role became more significant. I remember there was concern then, as there is now, about dwindling resources and nurses leaving the profession. Throughout the past 30 years, senior nurses have had to work hard to recruit and retain sufficient skilled nurses to meet service needs. That remained a core activity in my 20 years as a nurse director, initially at the Royal Brompton, then at the Royal Brompton and Harefield NHS Trust. Now, though, the shortage is deep, chronic and continuing. Nurses remain a keystone of clinical services, they have developed new roles, and senior nurses have staffed services by recruiting from countries that were not targeted previously. But now we also have to think beyond nursing, about how we work with team members in non-registered roles. Some changes for senior nurses reflect how society has changed since the 1980s. People are mobile and jobs are not for life. Nurses are more assertive, independent-minded and less deferent to authority – all good things but sometimes challenging when attempting to cover shifts to ensure quality at all times. What has not changed is the commitment, hard work and professionalism of nurses. Public accountability has grown, perhaps more than anticipated, and we have to be open and honest with patients about the risks and benefits of treatment. Patients’ expectations have increased and their views are sought much more than they were 30 years ago. There is a duty to be candid when things go wrong and to implement a learning culture where improvements are made. Senior nurses must have the skills to interact with patients and families when difficult conversations are needed. There are also complex relationships now between purchasers and providers of healthcare, regulation and reviews of clinical quality and enhanced accountability. Networks and pathways of care across different sectors are being developed, with the result that senior nurses have to work with colleagues from outside their organisation. There are more advanced roles, with nurses leading care or undertaking a range of interventions. Nurse directors do not often manage the nursing team but are still professionally responsible for all aspects of nursing practice, education and training, research and the well-being of the team. Greater flexibility in the nurses’ rota is expected, along with part-time working, and often the senior nurse has to negotiate with rather than tell nurses when they will work. Senior nurses work in multidisciplinary teams. Role boundaries between disciplines, particularly with doctors, have changed and with that has come a need to work in a network structure rather than relying on a traditional hierarchy in nursing. Nurses have to keep up to date – something Nursing Standard can help them with. In 1987 we did not focus in the same way as now on safety, effectiveness and the quality of the patients’ experience. Targets and measurement were not so prevalent, nor knowing about errors and incidents and reporting openly on them. I remember drug errors being identified locally in the clinical area, but it did not trigger a senior review or discussion at board meetings. Today there is more balance on boards between finance and quality, and more emphasis on patient care than in the 1980s. At that time I had not heard of ‘integrated governance’, which is now often led by the nurse director. Nurse directors share responsibilities with other board members and usually have roles beyond nursing, frequently clinical governance and patient engagement, increasing nurses’ influence. Scrutiny by the public and others, increasing demands on health services, declining financial resources, together with rapid communication engendered by technology, mean work is more complex and pressured than it was 30 years ago. Change occurs rapidly, decisions are required ‘now’ and mistakes make headlines, causing senior nurses to feel vulnerable. At its heart, however, the role of the senior nurse remains as it ever was: to provide excellent patient care by competent, educated, satisfied and well-managed nurses and to nurture the next generation. When this comes together there is a wonderful sense of knowing it is all worthwhile. The future is unpredictable. No one can say with any certainty where we will be in another 30 years. But I am sure that senior nurses need to continue to be flexible, deal with uncertainty, work in multidisciplinary teams and drive change.